For this installment of the Top of the Heap series, I spoke with Elizabeth Lewis, who is a doctoral candidate in anthropology at the University of Texas at Austin, as well as a disability writer, blogger, and advocate. For several months now, I’ve been thinking about the relationship between ethnography, narrative nonfiction, and fiction, and the possibilities for navigating between those genres ethnographically. I am in the process of weaving together several overlapping projects on rare and undiagnosed disabilities in the U.S., and my current writings explore how diagnoses animate everyday life and unsettle historical understandings of disability-as-difference. It sounds clear enough, yet I’ve been plagued by nagging questions of form and voice, as well as function and translatability. As always, I turned to my bookshelf for answers. My booklist these days centers on three categories: popular writings on disability, ethnographies, and an additional “Other” group consisting mostly of works from disability studies and the history of medicine. I just started Nathaniel Comfort’s The Science of Human Perfection, a fascinating exploration of the history of medical genetics and eugenics in the U.S. My research focuses on undiagnosed disabilities and, for this population, genetic technologies can be a critical tool for obtaining diagnostic information that was unimaginable in the recent past. What do genetic explanations do and mean for disability populations that are so small, sometimes with only one or a handful of cases of a particular syndrome known worldwide? How does this new knowledge potential intersect with the complex history of eugenics and disability? Along these lines, I was also thrilled to learn of two new books on diagnosis, Annemarie Goldstein Jutel’s Putting a Name to It: Diagnosis in Contemporary Society and Carolyn Smith-Morris’ edited volume, Diagnostic Controversy: Cultural Perspectives on Competing Knowledge in Healthcare. In the last year, I’ve been pleasantly surprised by the growing number of popular books on disability themes. 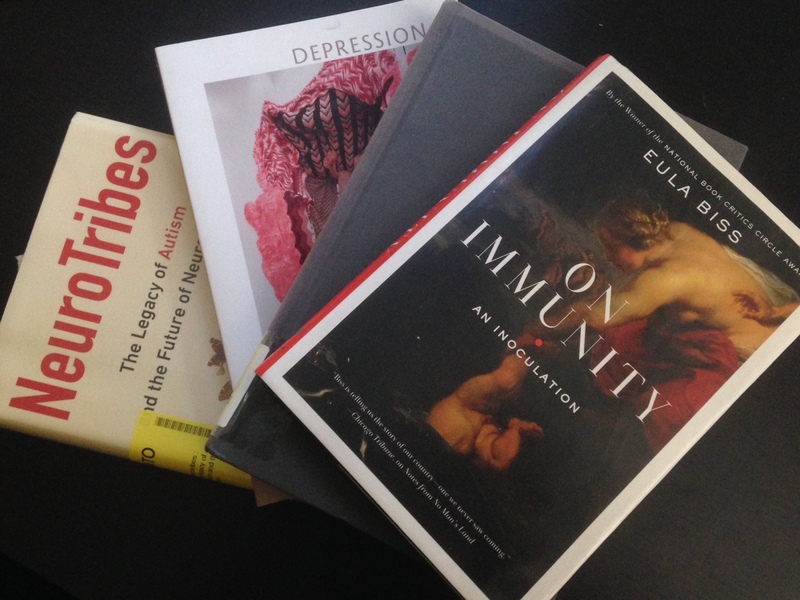 Here, I think of several critically-acclaimed texts, including: Akhil Sharma’s Family Life, Eula Biss’ On Immunity: An Inoculation, Andrew Solomon’s Far From the Tree, Lisa Genova’s Still Alice, and Susan Nussbaum’s Good Kings Bad Kings. For disability fiction, José Saramago’s Blindness is next on my list. Each of these has played a critical role in making disability a more central theme in current literature, and I am curious to see what will follow. While my work does not focus on autism, I would argue that one cannot address questions of public understandings of disability in the U.S. without considering the conceptual shift to the spectrum. As Rayna Rapp and Faye Ginsburg wrote earlier this year, the notion of the spectrum itself has greatly altered and expanded contemporary disability worlds. Autism — as both a diagnostic category and ethnographic object — animates ongoing public anxieties about vaccines, is a fixture of contemporary news stories on families, education, and medicine, and has become a pop culture fixture (see The Reason I Jump). I recently picked up Neurotribes: The Legacy of Autism and the Future of Neurodiversity from the library, a popular press book by science writer Steve Silberman, and I am excited to get started. I am continuously frustrated by most media coverage of autism, which tends to frame it as a concrete, unchanging diagnostic reality and erases social, cultural, and historical context. There is significant room for intervention there, and anthropologists are perhaps particularly well-suited for this role. Two books that have been on my (electronic) shelf for far too long are Mel Chen’s Animacies and S. Lochlain Jain’s Malignant. I also eagerly anticipate the release of Zoë Wool’s After War. Periods of war have long been closely related to shifts and surges in disability awareness, and I am eager to see how Wool’s ethnography might animate my own writing and thinking on disability (similar to my experience reading Kenneth MacLeish’s Making War at Fort Hood). Finally, even as my bibliography grows in length and scope, such texts as Kathleen Stewart’s Ordinary Affects, Hugh Raffles Insectopedia, Lauren Berlant’s Cruel Optimism, and Elizabeth Povinelli’s Economies of Abandonment are never far from my mind. A bookshelf must not be overly serious, however, and I am trying to be mindful about incorporating more leisure reading into my daily schedule. One doesn’t have to look hard to see a curious spike in novels about anthropologists. I greatly enjoyed Lily King’s fictionalized work about Margaret Mead and Gregory Bateson, Euphoria, and look forward to reading Satin Island, Tom McCarthy’s novel about a corporate anthropologist, which was shortlisted for this year’s Man Booker Prize. The story of an ethnographer wrestling with the meaning of life from his basement office at a global corporation? Ranting against the tendency to fetishize events, instead seeking underlying systems and structures? Generally making ethnographic mischief? Sounds like good bedtime reading to me. Elizabeth Lewis is a doctoral candidate in anthropology at the University of Texas at Austin, as well as a disability writer, blogger, and advocate. Her current research examines family experiences with undiagnosed disabilities in the U.S. She is particularly interested in expanding digital methodologies for research on disability, as well as exploring new possibilities for writing about disability ethnographically. She is increasingly interested in questions of emergent disability categories, as well as the relationship between diagnosis, race, and gender. Elizabeth is active in disability projects both within academia and in applied initiatives. For more, please visit her personal website and her blog, Disability Fieldnotes, and connect on Twitter at @lizlewisanthro. Gibson H. Top of the Heap: Elizabeth Lewis. Somatosphere. 2015. Available at: http://somatosphere.net/2015/top-of-the-heap-elizabeth-lewis.html/. Accessed April 26, 2019. Gibson, Hannah. 2015. Top of the Heap: Elizabeth Lewis. Somatosphere. http://somatosphere.net/2015/top-of-the-heap-elizabeth-lewis.html/ (accessed April 26, 2019).